St. Patrick’s Day means different things to different people. But no matter how you celebrate – be it with friends, costume parties, whiskey or a session of Irish yoga – chances are it’s going to be the most fun you have at a public event this year. If you’re planning on celebrating St. Patrick’s Day 2015 in Melbourne, here are few of the best places to go and the perfect costumes to wear there. On any given day, you’ll find enough Irish joviality in this lively pub to trick an unknowing Aussie into thinking it was St. Pat’s. So on March 17 – the actual St. Patrick’s date for 2015 – you can expect the kind of Celtic celebrations that are so good you’ll remember them never. This year at P.J. O’Brien’s in Southbank, there will be celebrations from morning ‘til evening, kicking off at 8am with the Big Irish Breakfast (which, of course, includes the requisite pint of black stuff) and lasting well into the wee hours, with Irish dancers and live bands all part of the festivities. 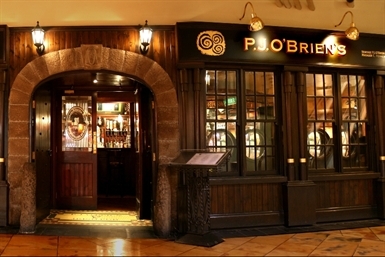 If you choose to spend your St. Patrick’s Day in an Irish pub, it’s likely that drinking will be high on the agenda. As such, we believe the perfect costume for St. Pat’s at P.J. O’Brien’s is this fancy dress pint glass. Why be coy, after all? Wear your heart on your sleeve. A few years ago, there were fears that The Dan O’Connell pub in Carlton may no longer be able to host its beloved St. Patrick’s Day celebrations due to a change in liquor law restrictions. Here we are in 2015, however, and one of Melbourne’s best and most-loved Patty parties is still going strong. Kicking off at 7am, the soldiers at Dan’s will be welcoming green-clad festival-goers with a traditional Irish brekkie. No worries, though – if the promise of black pudding and colcannon isn’t enough to get you out of bed at that time, the hooley runs all day, spilling out from the pub and into the adjacent park. With all the dancing and frolicking that you’ll be partaking in with your new friends at Dan’s, your fancy dress choice needs to be geared for movement. If you’re planning on going to The Dan O’Connell festival, you’ll be wanting to avoid bulky, restrictive costumes. We recommend a spritely Leprechaun as the costume of choice. Due to the shower of savages that inevitably flock to The Quiet Man’s exuberant St. Patrick’s Day festival each year, you can expect the drink lines to be long. With that in mind, we recommend this ‘Cheers ‘n’ Beers’ costume, so you can stock up all at once and avoid the crowds for as long as possible. A pure stroke of Irish genius, that is. The Melbourne Irish Festival is held annually in North Fitzroy’s Edinburgh Gardens on the Sunday before St. Patrick’s Day (this year falling on 15 March) – an excuse to kick off the celebrations early. A family-friendly fun day that is open to all ages, this is a yearly opportunity for Melbourne’s community of Irish ex-pats – as well as green-clad fun-lovers of diverse heritage – to come together and celebrate the many contributions of Irish culture to modern Australia. The diversity of Irish culture is reflected in the diversity of activities on offer at the festival: from Irish dancing to street performers, children’s activities, live music and even a petting zoo. Regardless of your family status, shenanigans are sure to ensue. Since this is a family event, we recommend a cost effective costume that can be worn by the whole family for a tight-knit, matching look that’s guaranteed to mortify the wee ones. Shamrock clover glasses are perfect for festival-goers, as they don’t restrict your movement, can be bought on the cheap, and span both genders and generations. For more to do on St. Patrick’s Day 2015, visit www.stpatricksday.com.au. For more St. Patrick’s Day costume ideas, visit Blossom Costumes.